RML and AD Group are pleased to announce the signing of a new partnership with Honda Performance Development, Inc (HPD), for the supply of engines for the team's LMP sports prototype programme in 2010. The agreement will see the team's Lola B08/80 powered by the HPD LM-V8 engine, making this the first Lola coupé to benefit from the proven normally-aspirated 3.4 litre unit. Following the company's founding in 1993, HPD was responsible for the development of Honda's Champ Car and IRL racecars in the United States, as well as the more recent championship-winning Acura ARX sports prototypes competing in the American Le Mans Series. Since its introduction the HPD LM-V8 has recorded 15 wins, 13 pole positions, and 12 track records in the American Le Mans Series. The HPD LM-V8 engine’s exceptional record for reliability began with a class win at its inaugural race at Sebring 2007, and continued through to 2009, when Fernandez Racing used it to equal the ALMS series record for wins in a season and took the 2009 ALMS LMP2 manufacturer title as a result. "We are delighted to be working with a new engine manufacturer in Honda Performance Development," said Ray Mallock, Founder and Chief Executive of Ray Mallock Limited (RML). "RML's greatest achievements have come as the result of working closely with some of the world's leading engine manufacturers. This is our first opportunity to develop a relationship with HPD; a company with a tremendous track record for designing superbly engineered, powerful and reliable race engines. Even in the very short period that we've been working together it has already become obvious that HPD understands exactly what it takes to win at the highest level, and that gives us cause to look towards the coming season with considerable optimism and confidence." Mike Newton, CEO of AD Group, the team's major sponsor, and also co-driver of the Lola HPD, shares that belief. "We are anticipating what should be a very competitive engine programme," he said. "All the signs suggest that the HPD LM-V8 will be a highly reliable unit, and should allow us to move forward from the difficult times we've experienced during the last two seasons. The team has always been capable of running near the front of the LMP2 class, and given a reliable package we know we can deliver regular podium finishes as well as championship results. The importance of reliability cannot be over-emphasised." Thomas Erdos has been co-driving with Mike since 2003 and has been involved in all the team's major successes, including successive class wins at Le Mans and the Le Mans Series LMP2 team and drivers titles in 2007. "It's great to be working with a major manufacturer again, and I just can't wait to get started!" was his first reaction. "There are still unknowns with the HPD engine, of course - how it will perform in Europe, on European circuits, over the longer distances, and with European fuel - but it's a proven, reliable and powerful unit, and it has tremendous potential for further development. It has a very impressive record in the American Le Mans Series, and I just hope we can extend that record over here." 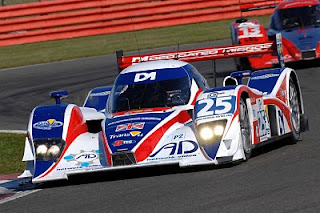 The team retains the same Lola B08/80 chassis that secured second in LMP2 at Silverstone in the final Le Mans Series race of 2009. The swift installation of the LM-V8 has been made possible with the support and co-operation of Lola Cars of Huntingdon and HPD Inc, and will result in a shakedown test within the next fortnight.